We are on the cusp of the API economy: APIs are everywhere, boosting the digital transformation and disrupting the way we think. So a shifting is required also in the way we develop. APIs are expected to enable automation, in turn driving efficiency, consistency and cost savings. API quality matters, both for API consumers and implementers. For these reasons, building an API infrastructure from scratch may not be a good idea. It is much easier and more productive to use a good framework or library, often more than one. From a development point of view, it's crucial to achieve target whilst ensuring the fulfillment of the following requirements: timing, costs saving and quality. Standardization is one of important way to achieve those goals: to ensure consistency, speed-up development, enable factorization and simplify maintanance. Furthermore, a very important factor in APIs is a complete and accurate documentation. And best of all, the documentation should be produced and provided in a standard form, to automate the documentation process and to ensure a great overall experience in API consuming. Even for the simplest API, achieving all these goals and accomplishing all the required tasks may be not so simple for a developer. A minimal infrastructure must be setted up, a set of components has to be selected, configured and enabled to work together. The API implementation stack configuration can be a complex, repetitive and error-prone process. The developer should not take care about the configuration and components integration details, focusing on the business tasks the API has to face and resolve. It is where standards, frameworks and libraries come to help, taking charge of the API infrastructure setup and configuration and leaving the developer free to focus on the API goals. In one sentence: focus on what matters and forget the tedious stuff. The Holon Platform can act both as glue for industry-standard libraries and as a catalyst for API development productivity. 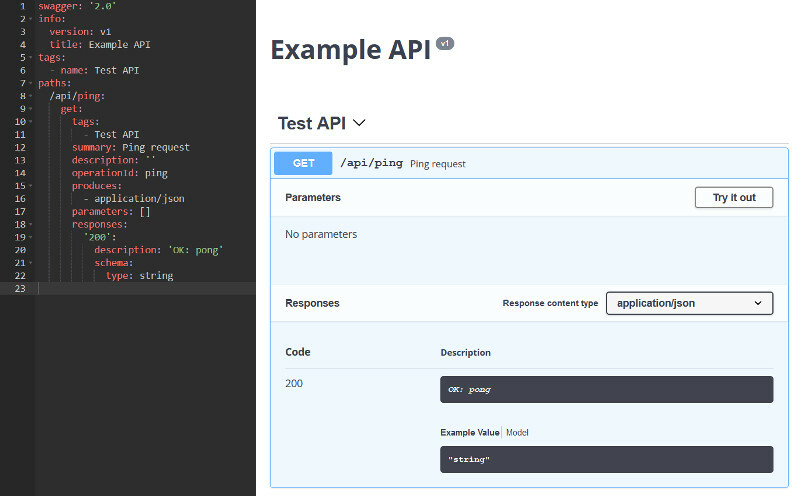 In this post, we'll start from the beginning, showing how to create a simple API service. We'll focus on project setup and configuration, leaving out the API business logic concerns. In fact, this API will provide a single "ping" operation, which will respond with a pong message. The code of this example is available on GitHub: https://github.com/holon-platform/spring-boot-jaxrs-swagger-api-example. Maven is used for project setup and dependency management, so let's start with configuring the project's pom dependencies. First of all, we import the Holon Platform BOM (Bill Of Materials), this way we'll no longer need to specify the Holon Platform artifacts version. The right version of each artifact is declared and provided by the platform BOM. These Holon Spring Boot starters inherit the standard Spring Boot web starters, and provide embedded servlet container configuration, logging and Holon specific auto-configuration facilities. By default, Tomcat is used as embedded servlet container. Want to use Undertow? Just change the starter name (for example, holon-starter-jersey-undertow). Concerning JSON data format instead, Jackson is automatically setted up. What if Gson is your preferred choice? It's only about changing a name, again (for example, holon-starter-jersey-gson). Note the @Component annotation on the API endpoint class. This is a standard Spring annotation to declare this class as a Spring component, candidate for auto-detection. Relying on the Holon Platform auto-configuration features, this class will be automatically detected and registered as a JAX-RS resource in Jersey (or Resteasy). And of course, will be enabled as a Spring component, allowing, for example, dependency injections. This way, a runnable jar will be created by the Spring Boot plugin, with all the required dependencies and able to be execute standalone using a JRE. We'll use Swagger for API documentation. The Swagger specification is now the foudation of the Open API Initiative, which is trying to standardizing on how REST APIs are described. The Holon Platform provides many configuration facilities for Swagger, perfectly integrated with JAX-RS and the Spring Boot auto-configuration architecture. From now on, the Holon Platform auto-configuration services will auto-detect any JAX-RS endpoint annotated with the standard Swagger @Api annotation and automatically create a JAX-RS endpoint to generate and provide the Swagger API documentation. By default, this endpoint will be mapped to the /api-docs path and supports a type query parameter to obtain the Swagger API documentation as JSON (the default behaviour) or YAML. Standard Swagger annotations are supported to enrich and configure the API documentation, such as @ApiOperation. Additionaly, the Holon Platform Swagger module provides a set of configuration properties, which can be placed in the default Spring Boot application configuration file (for example application.yml) and used to configure the overall API informations (such the title and the version) and to change the default API documentation endpoint path. As a last step, we want to add application monitoring and management capabilities, using the Spring Boot Actuator, which adds several production grade services to obtain application information, health check, configuration and so on. But wait... things do not go as we expected: the server renponds with a 404 (not found) error code! Why? This is a well-known and annoying problem which occurs when the Jersey servlet is mapped to the root context path. The problem is that Jersey will get all the request. It does not know that it needs to forward to any actuator endpoints. With 2 Java classes, a pom and a Spring Boot configuration file we setted up a production grade API application, able to be runned standalone, with API documentation and monitoring capabilities. Now it's time to focus on business tasks, making the API somehow useful! This this only the first article in a series that shows how to use the Holon Platform to face the API development challenges, including the microservices world, so stay tuned! The source code of the example API created in this post is available on GitHub: https://github.com/holon-platform/spring-boot-jaxrs-swagger-api-example. NOTE: See https://github.com/holon-platform/spring-boot-jaxrs-swagger-api-example/tree/swagger-v3 for the Swagger/OpenAPI Version 3 specification version of this example. See the Holon Platform examples for other API development related sample projects.